The ETP Omni-channel Store provides your customers a seamless O2O experience across all your stores, e-commerce sites and other touch points. The ETP Omni-channel POS software is integrated with an in-transaction CRM solution which creates a single view of the customer right from registration to billing and customer specific promotions to loyalty management. It is fast, reliable, easy to learn and use with touch-screen technology – making ETP Store a retail POS software that turns your Point of Sale into a point-of-delight for both your customers and your store staff. 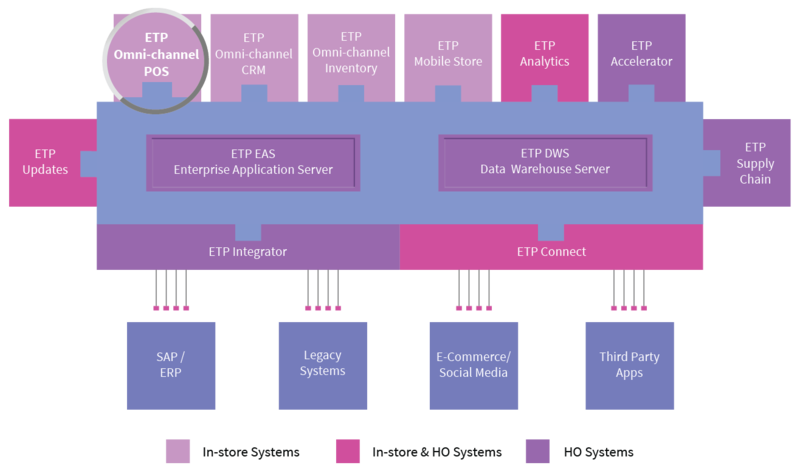 ETP Omni-channel Store is a JPOS compatible Java based and platform independent robust and flexible retail software, capable of high volume transactions that can fit within various corporate environments thus leveraging your company’s existing IT infrastructure and lowering your operational costs. It is Payment Card Industry Payment Application Data Security Standard (PCI PA-DSS) certified so you can ensure data security of your customers’ payment information. The solution offers features like click and collect, endless aisle and easy omni-channel returns and exchanges that help your e-commerce and brick and mortar channel work in harmony. Customers can purchase products online and pick them up at their preferred store outlets, they can order products not available in stores and have them shipped directly, and they can also return a product at the store or have it collected from the desired location, irrespective of the channel of purchase. Using the omni-channel retail CRM software, customer-based promotions can be developed, tracked and modified while capturing valuable customer feedback. The intuitive omni-channel POS for e-commerce solution ensures improved brand visibility, sustained engagement, easy access to products and cross/up-selling promotions to increase the revenue per customer steadily. The ETP e-commerce omni-channel POS solution also does quick and detailed billing, cash management, reports, gift vouchers, audit trails and can run in online as well as in offline mode. The CRM solution through the POS software helps the store staff to quickly lookup customers and add or update details bolstering the central CRM database further.